Le Marche in Central Italy and its superb scenery is home to many well preserved fortified hill towns which include Roman ruins at nearby Urbisaglia and Falerone, renaissance architecture at Loreto and Osimo and ‘Liberty’ style art nouveaux villas at Porto San Giorgio and Civitanova Marche. Macerata is well known across the opera world for its annual open-air opera festival in July and takes place in the 7,000-seater Sferisterio – a very impressive neo-classical arena that was built with private funds in the 1820’s. It was originally built as a soccer stadium rather than a Puccini aria. 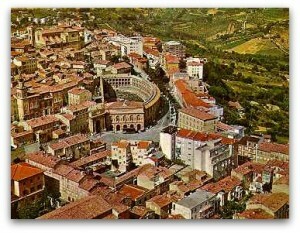 The centre of Macerata is quite up market and was almost entirely built between the 16th and 19th centuries. The Renaissance two-tiered arcades of the Loggia dei Mercanti on central Piazza della Liberta’ is the town’s most striking piece of architecture. 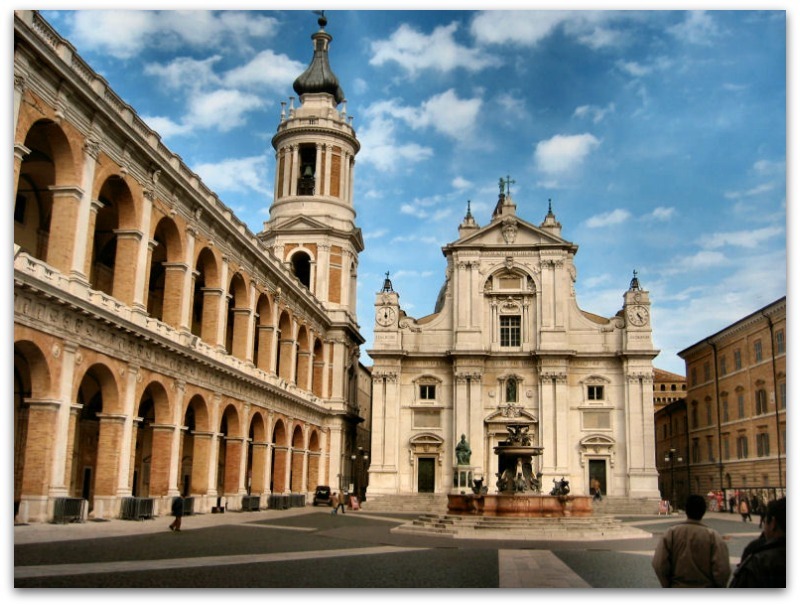 The best of the the Macerata palaces line Corso Matteotti, the road that leaves the Piazza at the side of the Loggia, while Corso della Repubblica will take you to Piazza Vittorio Veneto and the town gallery and museum. Home to many Umbrian and Marchigiani artists – most important is Carlo Crivelli’s Madonna and Child. In the same building are the fine carriages in the Museo delle Carrozze and a museum dedicated to the Unification of Italy and wartime resistance. 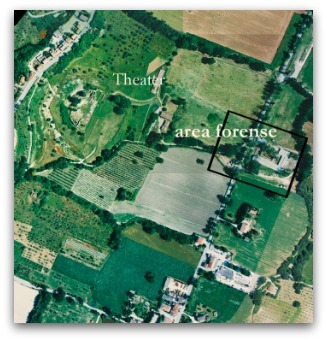 Just north of the town, by the river at Villa Potenza, lies ancient Helvia Ricina, the remnants of the old Roman city can still be seen, including the large amphitheatre, which stands just by the junction with the SS571, as well as a stretch of stone-paved roadway. The Cistercian monastery of Fiastra was founded in 1142, the building material was taken from the near Roman city ‘Urbs Salvia’ whose farmland stretched 30km to the coast in medieval times. 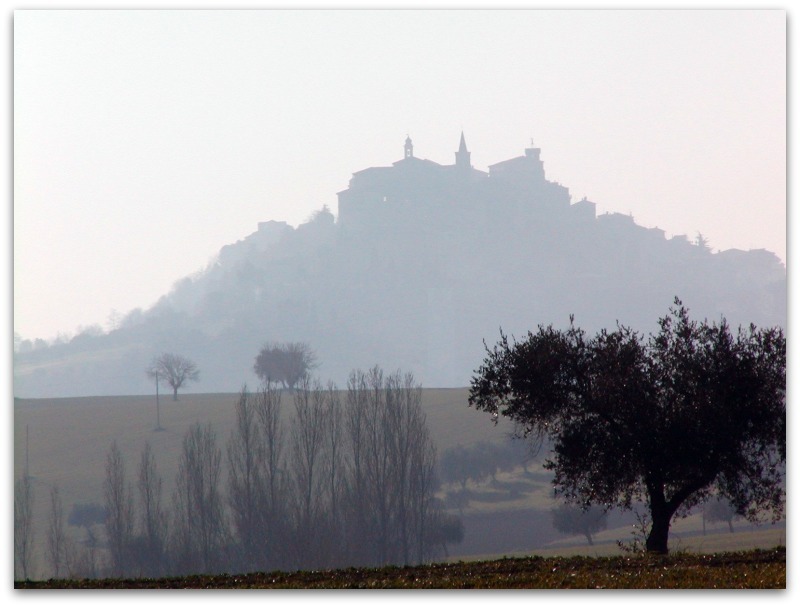 Today the surrounding parkland is still cultivated by the monks and wines and other produce is on sale to the public, there are two very good well priced restaurants, and the medieval monastery, an archeological museum and beautiful nature reserve are open to the public. This thriving and elegant centre is one of the most interesting towns in central Le Marche, has a sophisticated old centre and lively cultural life that has earned it the nickname “Milano of the Marche”. Jesi’s most striking feature greets you as you arrive – is an enormous stretch of massive 14thC fortified walls (above), built on Roman foundations, these are reinforced with buttresses and impregnable towers, and topped by houses. The main streets of the walled historic centre run along a narrow ridge and provide many temptations to the Le Marche visitor. In Piazza Federico II in the north-eastern corner of the town where the Roman forum of Aesis once lay.In the Piazza stands the 18thC Duomo, a few steps down Via Pergolesi and you will be in Piazza Colocci and in front of Jesi’s most handsome building, Palazzo della Signoria (below). This Renaissance palace was built at the end of the 15thC by Francesco di Giorgio Martini, the Sienese genius best known for his military architecture. The large rampant lion above the entrance is the symbol of the power the city once held. Inside there is an impressive three-tiered courtyard with brick columns on the first level, marble on the second and wooden on the third. 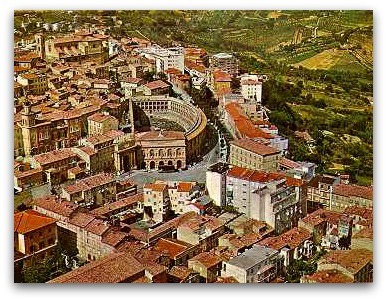 Continue along Via Pergolesi to Piazza della Repubblica; Jesi’s largest square is dominated by the town’s 18thC theatre, Teatro Pergolesi, home to a prestigous autumn opera season.The main road Corso Matteotti runs straight along Roman foundations. On Via XV Settembre stands Jesi’s most stylish building, Palazzo Pianetti, the ornate interior is home to the civic art gallery (Pinacoteca Comunale) with a small collection of Lorenzo Lotto’s finest works – The Judgement of Santa Lucia, a Visitation, an Annunciation and a restless Deposition. Only 5 minutes drive from Abbadia di Fiastra and is home to the impressive Roman site of Urbisaglia which provides tours of its frescoed forum, theatre and amphitheatre, the roman water cistern, medieval castle and museum with Roman artefacts from the area. There is also a good ristorante Le Logge for Lunch. The striking hill town of Loreto lies just inland from the Adriatic Sea and is one of the world’s most important shrines to the Virgin Mary. The town is host to thousands of pilgrims who travel here from around the world. The great dome of the Sanctuario della Santa Casa dominates the countryside for miles around; under the roof stands the rustic cottage from Nazareth that witnessed the Annunciation and the childhood of Jesus (see the tradition of the Holy House below). 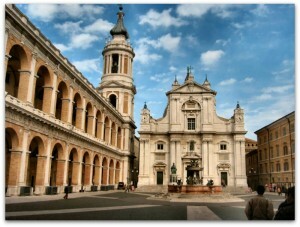 Although the Holy House arrived, according to legend in 1294, but it was not until 1507 that the Church finally approved of Loreto as a place of pilgrimage, though work on the church had begun in 1468. The Sanctuary is a showcase of work by many of the most celebrated names of late Renaissance Italy and gives even the unbeliever good reason to come here.. The Museo-Pinacoteca inside preserves a fine group of late works by Lorenzo Lotto (the Venetian master retired and died in the monastery here in 1556) and an unusual collection of Renaissance ceramic pharmacist’s jars. Hidden away in a corner are also some 70 carved blocks of box-wood used until the 1940’s to stamp designs on pilgrims bodies which were then indelibly tattooed as permanent souvenirs of their pilgrimage to Loreto. A fantastic town that towers over the surrounding countryside and is referred to as “Balcony of Le Marche” Climb up Corso Garibaldi to Piazza Vittorio Emanuele, was built on the site of the forum of Roman Cingulum and is still the heart of this lovely town. To one side stands a fine 16thC Renaissance town hall with a much earlier clock tower. Inside is the Museo Archeologico to see the collection call at the library (Biblioteca comunale) in Via Mazzini 1. The library also houses the town’s Pinacoteca, or art gallery, with another of the region’s serendipity collections of paintings by Lorenzo Lotto. Cingoli has its ownm sizeable lake with beaches and pleasureboats, below the dam is an adventure park with zip wires, tightropes and climbing walls. The city of Ascoli Piceno is dominated by numerous medieval towers and the Piazza del Popolo which is tiled with travertine and undoubtedly one of the most elegant squares of Italy. An amazing array of gothic architecture, great riverside walks, shopping and art galleries, plus some wonderful bars to sample the local Piceni wines. Oh, make sure you do some people watching in the Art Nouveaux Bar Meletti in the main Piazza. Caldarola dominated by well preserved Pallotta castle, where building started in the 9th Century and which was transformed in the 16th by the Pallotta family, who still own the castle and now open it to the public, there are also 3 other castles in the surrounding Marche countryside. The panoramic university hill town of Camerino has a history that goes back to Neolithic times. It has remained unchanged since its Renaissance heyday, when the local Da Varanno family governed much of surrounding Le Marche. Imposing churches, palaces and art plus lovely gardens, museums, outdoor cafes and some great shops. This touring centre for the Sibillini national park has a wonderful gothic piazza, sit in one of Amandola’s bars there and watch the world go by, or try getting up and sampling the museum of rural history. Tolentino is a vibrant medieval city home to the shrine of St Nicola, and some amazing architecture including an ancient roman bridge and a bizarre clock tower in the main square and the nearby 12th century Castello della Rancia. Wander round the museum of caricature and humour in art, or simply enjoy the shopping, cafes and trattorie. Recanati is a sophisticated town and comune in the Province of Macerata, Marche region of Italy. 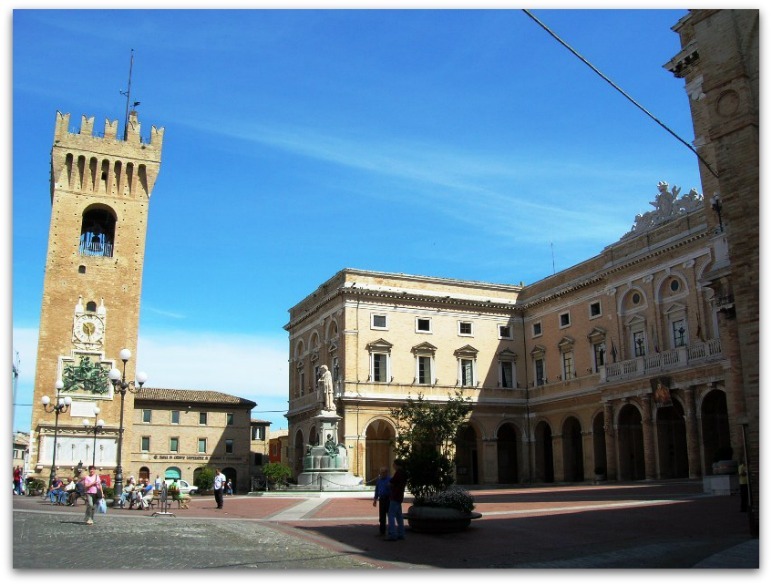 Recanati was founded around 1150 AD from three pre-existing castles. In 1290 it proclaimed itself an independent republic and, in the 15th century, was famous for its international fair. In the March 1798 it was conquered by Napoleon Bonaparte. It is the hometown of tenor Beniamino Gigli and poet Giacomo Leopardi, which is why the town is known to some as “the city of poetry”. It contains the Teatro Persiani named after the composer of operas in the first part of the 19th Century, Giuseppe Persiani, who was born in the town in 1799. The town commands an elevated position above rolling hills to the West and the adriatic coast to the West, in Summer a superb Opera season is hosted at the Villa Corrado Mels home to a number of important Lotto paintings. 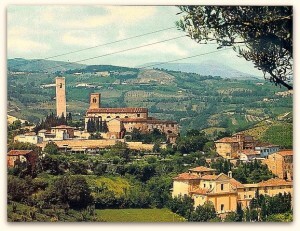 A few kilometres from Recanati stands Osimo with its honey coloured centro storico on the hill above the more modern town below. Most of its best buildings date from the 16th and 17th centuries but evidence of a more distant past sometimes show through. For this place was once the Roman town of Auximum. Take time to wander its inviting streets. The entrance hall of the fine 17C Palazzo Comunale, or town hall, in main Piazza del Comune are a dozen headless statues from Roman times; they once stood in the town’s forum and were, according to tradition, decapitated during an early occupation of the place. Also hunt out the sturdy blocks that remain of the Roman walls above Via Fonte Magna and notice that the street plan of the old town still retains its Roman layout. The 13C Duomo, with its amazing crypt, still retains its mosaic pavement from medieval times; the church, originally built in the 13th century in romanesque-gothic style. The old romanesque church of San Francesco has been fully restored and is a sanctuary dedicated to San Giuseppe da Copertino (1603-1663) and an important centre of pilgrimage. San Giuseppe is known as the patron saint of those undergoing exams and thanks also to his celebrated capacity for levitation, as a patron saint of pilots. His remains are kept in a crystal urn in the modern crypt. Founded around 550 AD after the Goths had destroyed the Roman Septembeda further down the hill, this enchanting town has a great mix of medieval and Renaissance buildings. Its outstanding feature is its unusual elliptical main square, Piazza del Popolo, encircled by shady arcades (see above) and towered over by the castle and church on the hill. Before taking your aperitivo here, search out the Pinacoteca in Via Salimbeni 39, to see Pinturicchio’s sumptious Madonna della Pace and earthy pictures by the local Salimbeni brothers. You can see more of their endearing work in the nearby romanesque church of San Lorenzo in Doliolo. The town is home to a vibrant Saturday morning market and the San Severino blues Festival that stages Blues, acoustic and indie, rock gigs throughout San Severino and the neighbouring countryside in June / July each year. The centre for one of the Verdicchio wines from the Marche region, Matellica is a lovely and interesting town that is also home to the Armani fashion outlet, where you can buy this famous style icons clothing direct. Matellica is half n-route to Frasassi ; which has an incredible network of underground limestone caves that is the largest in Europe and a must see for any visitor. Tours every hour in most languages.